Griffin Homes LLC is family owned and operated since 2006. We strive to build a quality home with functional floor plan and best amenity list in town. We love building relationships with our customers and working hand and hand to make their dream home come to life. Whether you buy one of our existing homes or you decide to custom build with us, you will not be disappointed. Griffin Homes is a proud member of The Central Oklahoma Home Builders Association and is a company you can trust! We are currently building in Piedmont, Surrey Hills, Yukon & Mustang. 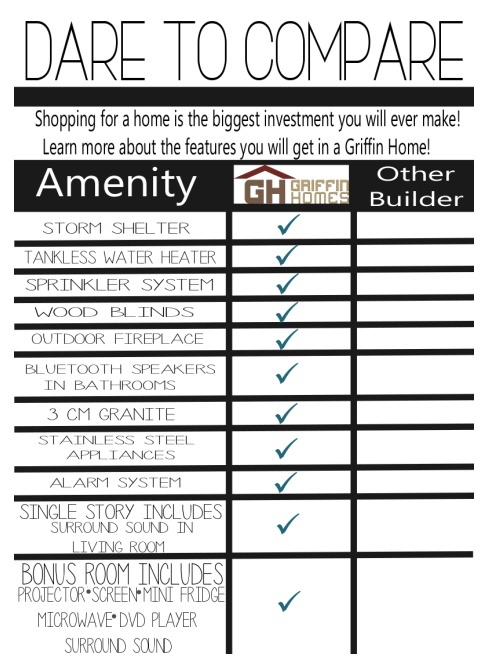 Check out our features tab to see what you get with a Griffin Home. call for a private showing! When making decisions on who you want to build your home you look for quality & quantity. DARE TO COMPARE list for information on what our big amenities are. Head over to the features page to see the whole list! We have been in our new Griffin Home for one week and we couldn't be happier! I am writing you this letter to share with everyone considering purchasing one of your homes. Your service, quality, and total package deal is what sets your home apart from the rest. This home is the fourth home that I have built in my lifetime which I think qualifies me as a new home critic. I was impressed from start to finish with the entire Griffin team and process. I felt everyone I came in contact with sincerely wanted this to be the best home for me and my family that they could deliver. Obviously, the quality of the home is superior but anyone can see that by looking through a model home. It wasn't just the quality that impressed me but the service. Most home builders become easily frustrated with their buyers because buyers tend to change our minds about what we want during the process. This happened to me but I was never treated rudely. Several times your team made accommodations for me and when I was asking for something that couldn't be changed they educated me on the process and explained why-all with friendliness and respect. I was looking at purchasing an existing home when I stumbled across your new homes. I thought I was not in a position to afford a new home because of all those expensive investments you have immediately such as tornado shelter, blinds, sod, guttering, etc. Much to my surprise you advertised a package deal. Everything I would need was included in the purchase price.